Gabor Maté, When The Body Says No. Have you ever noticed this trend in some of your clients? No matter how many years of therapy they do and no matter how many coaches they hire, they still come up against the same old blocks. Despite being a seasoned seminar and retreat junkie, they still struggle and sabotage themselves (in their relationships, businesses, health, etc.) over and over again. What’s interesting to note is these people are well-informed and actively engaged in seeking the best possible solutions for long term healing. Some are even coaches and healers themselves. So what’s missing and what are they doing wrong? Healing Undiagnosed Trauma (which I cover extensively in this other article). Knowing How to Feel & Process Anger & Healthy Aggression. 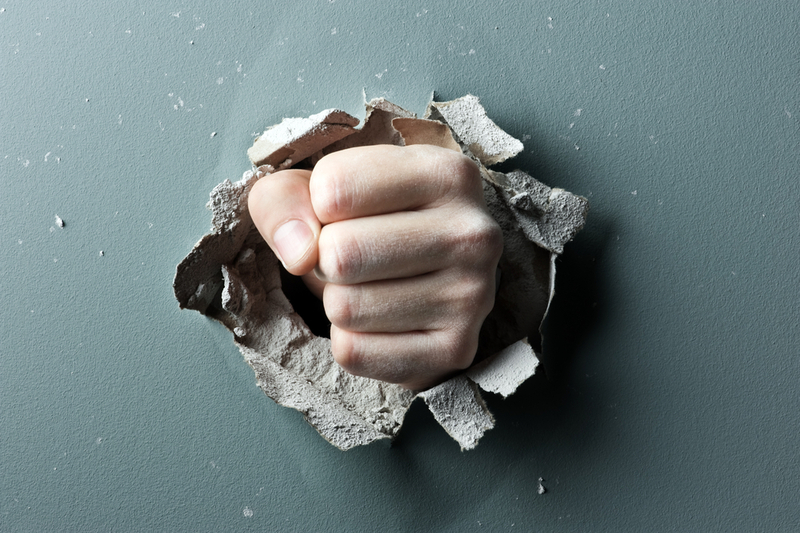 In this article I’m going to dive into the latter and I’ll address why accessing the positive power of healthy anger and aggression is a must — especially if we want to break out of our limiting beliefs and self-sabotaging behaviours. What anger actually is and that it’s real medicine when tapped into effectively & safely. I’ll share a real-life example that demonstrates how emotional repression starts young. How repressed anger turns into illness (physical & mental), plus self-sabotage. The steps that must be in place so that your clients can start to access their life force energy, which has been trapped inside of them for way too long. Pure and simple, anger is an emotion. It’s an essential, high-energy emotion that’s been getting a bad rap for way too long. When I speak and teach around this topic, the first thought people have is: “Well, we can’t go around being savages and slay everyone or everything that pisses us off, can we?” The answer is a resounding NO. It’s common for people to get anger confused with violence, crime and hate. Anger is an essential, primal, mammalian emotion, whereas violence (when there’s no actual need to protect oneself or others), crime, and hate are the byproducts of internalized, repressed and misdirected anger. Anger is a biological response to feeling some form of threat or injustice directed at us. It can also be a result of not getting what we need, not being listened to, not being understood, or not having proper emotional connection and attunement when we’re young. This latter reason seems to be all too common in our culture as many kids are poorly attuned by their caregivers and many parents don’t have the skills needed to know how to encourage and foster healthy emotional development in all shapes, sizes and colours. (This occurs because the parents didn’t get it either; it’s a nasty cycle that can only stop when we put in the work and learn what to do.) All too often there’s a negating of kid’s mistakes and toxic forms of shame and abandonment are used liberally to “teach” them good behaviour. Think of the classic time-out or sending a child to their room. These are all too common and accepted methods of punishment. These only serve to disconnect & shut down a kid’s nervous system. They may appear more ‘behaved’ and obedient, but they’re simply in a physiological stress reaction that’s riddled with anxiety, fear, and a sense of worthlessness. And then we wonder why they struggle in school and can’t concentrate! Setting healthy, strong boundaries and positive forms of discipline in connection with, and alongside, our kids is essential. This is an important tactic in demonstrating healthy parenting force (aggression), but without harm or abuse. Further to this many parents don’t have the capacity themselves to emote fully (anger, joy, sadness, fear, disgust and surprise) and set strong boundaries because they never saw it when they were growing up; or the flipside is the way it was done when they were growing up was like my example above: toxic, abusive and abandoning. This means that if those parents never stopped to heal their own childhood wounds and rewire towards healthy patterns of relating it gets passed on to their kids, and so on. And so the cycles of trauma, poor human relations, illnesses of the body and psyche, and lackluster life energy continue. We can stop these cycles and this article is a first step in explaining the intricacies of the human condition and why so many continue to struggle with self-sabotage and live less than ideal lives. I want to dive a little deeper into this whole kid thing because it’s important to understand how our early life, and the way we were either allowed, or not allowed, to show our full humanity, will either harness or hinder our capacity to move forward and take action in life. The Temper Tantrum. An example of anger and frustration in action. When a child throws a temper tantrum and stomps their feet in rage, it’s interpreted by many that the child is misbehaving and trying to be difficult, but this is not the case. They’re emitting frustration, which will lead to higher emotional states of anger and eventually rage if the parent isn’t equipped to deal with these big internal energy storms. In this fit of rage a child is overwhelmed. Their body sensations are on high and what they need is help coming down: they need help self-regulating so they can come out of their overstimulated state. A little while back I was just watching a little girl who was clearly upset about something and the father was actively ignoring her and her pain. It was so hard to watch, but I wanted to see how it ended. Every time she tried to reach up to him with her tiny 2-year old hands (all she wanted was connection and help regulating her nervous system and her upset), he’d turn his head and walk the other way. It got to a point where he was toying with her security and walking away from her, then circling back to her with a frozen look on his face. His body language was stone cold and his hands were held behind his back as if he was strolling through a park enjoying the chirping of birds and the nice warm weather. As he ignored her more, she started to collapse onto the ground with defeat. Soon she was oscillating between reaching up for him, but upon seeing (feeling) he wasn’t ‘there’, she’d collapse back to the ground. This broke my heart. In such a case, this little one’s needs aren’t being met and her emotional energy, her life force energy, is being squashed. Whatever it was that was upsetting her, her primal emotions were being shamed and the message, “I don’t like you” and “You are too much for me” and “Your emotions are not ok,” gets imprinted. It gets wired in when we’re most fragile and malleable. If this trend continues, her default will be to hold in her energy: the anger, the uncomfortable feelings, and even her organic spunkiness (which all kids have naturally!) so as to keep peace in the family. To keep safe from her dad’s rejection. To stay safe. She’ll conform to what has to be done so daddy doesn’t walk away and ignore her. As children, we need our caregivers for basic human sustenance. If we can’t get the love, attunement and care then we’ll do our best to still be ‘well-behaved’ and unemotional so we can at least secure our basic survival. And this compliance is instinctive, it’s not necessarily even conscious, because we’re hardwired to survive! If such a pattern continues in her life, and she consistently keeps the peace and doesn’t express her uniqueness, even when it might disrupt something for the good of others and betterment of the world, she’ll find a way to stop her progress, to play small, to self-sabotage. Of course, this is just one example of how emotional growth and pushing forward with our dreams can be stunted and stopped early on, but I believe this story can be applied to many people who fail to set healthy boundaries, have a fear of being seen, and shy away from their bigness. Understanding our early imprints; how we saw the world and what we needed to be loved is an essential first step in tackling this self-sabotage stuff. Then we need to assess the primary story we tell ourselves and begin to heal this suppression via healthy aggression and anger work that’s safe, contained and supported by those who know how to do this work. Anger is our friend, yet fearing it and holding it inside is our enemy. Biologically, it packs a big punch (pun intended) of energy to the body system, meaning it feels intense. In a society of love & light pushers and gratitude journaling junkies, the thought of anger and harnessing its healthy aggressive energies seems the opposite of evolving. But it isn’t. We need love, empathy and gratitude along with fierce primal emotion that protects us, keeps us safe and allows us to push forward and get what is our truest birthright: to be free and liberated so we can set off and do what we are meant to do. But most of my clients feel if they let their anger out, it’ll kill someone! That makes sense. That’s how strong the survival response is. We need to remember that we’re human animals; warm blooded mammals with the same basic autonomic responses as a wild animal and that our fight response is the same as a lion’s or bear’s. Only, when they’re threatened, the lion and the bear get to fight, kill, or be killed. Either way, the threat is resolved. But as young kids we really can’t fight, kill, or escape our attackers, especially when they are the very parents we need for survival or the siblings and peers we need in order to feel accepted and part of the tribe. And we have to understand that, as tough as it may be to believe, from the child’s nervous system’s perspective, a screaming, raging mom and/or an emotionally unresponsive dad both signal the same level of threat to a child as an attacking pack of hyenas does for a lion. When you boil it down, both are a threat to safety and possibly our life. For most kids who were abused, or chronically neglected, they had to suppress these incredibly powerful fight/flight responses which put then put them into freeze, which biologically, is the only option once fight and flight have been unsuccessful. But under that shutdown is a massive container of survival energy, wanting and waiting to be released. We must tap into this carefully and skillfully so that a person can access that livelihood again. Without it they’ll continue to be low in energy, boundaries will be difficult to set, and self-sabotage will continue. The other consequence of these insidious threats and non-completion of the fight and flee responses as a kid, is chronic illness: physical and/or mental. A groundbreaking research study called The Adverse Childhood Experiences Study is shocking the medical and psychiatric communities, because it tells us that at the core level most chronic illnesses (things like depression; anxiety; panic disorders; fibromyalgia; obesity; osteoarthritis; autoimmune disease; sleep difficulties, heart disease and even some forms of cancer, just to name a few!) are a result of early childhood adversity. 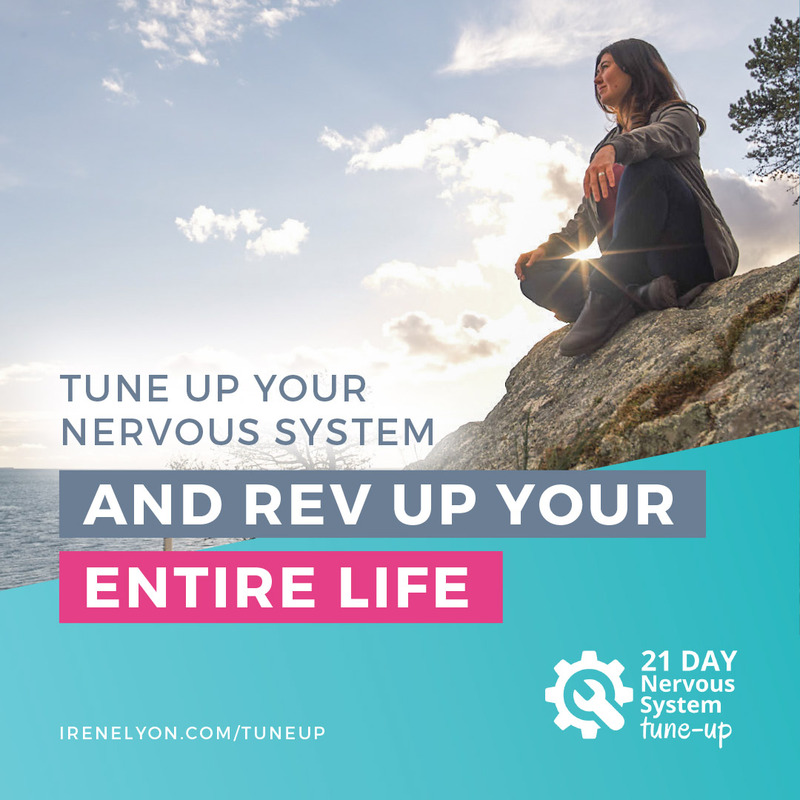 When a little person’s autonomic nervous system is constantly under attack, of ANY kind, they never get a chance to set up a solid nervous system foundation of healthy self-regulation. This faulty circuitry lends to suffering of all sorts later in life. Here’s where Healthy Aggression (and a whole lot more!) steps in. Like I said above, us humans are animals, too and we share the same primal emotions as other animals in the wild; joy, surprise, fear, disgust, sadness and anger. We can’t meditate our basic primal life force emotions out of us, nor would we want to. We need to access our anger and healthy aggression and not be afraid of it. Fear of anger is the killer. Fear of our own power and rage will stop us from moving forward. Remember from above: anger is just an emotion and it isn’t bad. Hurting others is. Aggression comes from the latin word, “Aggredi” which means to move forward, to attack, to understand, seize opportunity and/or attempt. 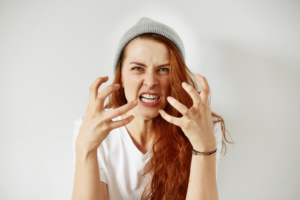 If we think back to the title of this article, Anger as Medicine: How to Cure Self-Sabotaging Behaviours – well… anger, healthy energy-rich anger and aggression is the antidote I’m talking about. When moving forward in any endeavour, be it for health, creating a new business, showing up for our loved ones, or risking failure via a new creative pursuit, we need to have this “aggredi” energy online and at our fingertips so we can keep going and never give up, even when it gets tough.Cause it will, right? If we lack this internal pilot light and can’t feel that flame burning bright it’s very easy to admit defeat, find ways to play small, not know our heart, or speak our gut, and continue to self-sabotage ourselves into misery. Understanding our biology, specifically our nervous system physiology and the stress response, plays a big part in our success, yet too often we focus solely on changing our behaviour or thought process. So, how do we start to tune into our biology so we can unleash the healthy beast? I wish it were something that was a quick fix. Or could be taken in pill form. But it isn’t. The steps to get started on this process are complex and intricate.And they work. First off, if this represents the clients you work with, and it’s because anger was either a) denied and seen as bad, or b) there was too much uncontrolled and abusive rage and violence, then know that it’ll take some time to build up the capacity to feel safe expressing anger. So we need a smart, slow and safe approach to unleashing this life energy. The other reason we want to take time will be if a person has any of the chronic illnesses I mentioned above, or you may think there’s a predisposition to them. This is because when you unlock a lot of stored up fight and flight energy and literally “defrost” someone’s nervous system (i.e, they come out of freeze and functional shutdown) they’ll undergo a cellular organismic change which will affect the entire system (organs systems; hormonal; circulatory etc.). Slow and steady wins this race and I cannot stress this enough. Question: Are YOU ready for this? First off, it is important to understand that changing these (anger, shutdown) imprints in the nervous system and healing trauma can’t all happen in one article … it is an ESSENTIAL starting point … as you’ll see below, but it is not enough. This is an entry point to understand why one might be self-sabotaging, and why. 1 – Because this is a delicate and lengthy process, EDUCATION is key. This idea of expressing anger and healthy aggression is new to us civilized humans, which means we need to understand how our internal body physiology and stress chemistry work. It’s also important to understand the finer details of unlocking emotions that have been held in for decades. For many, once this education is onboard a shift happens, and a person’s circuitry starts to crave and organically move towards a rewiring process almost immediately. Which means that after some solid educational pieces are in place, the next step is…. 3 – Working at the level of the stress organs is essential. When we’re in a cycle of unresolved survival energy the brain is signalling danger to the stress organs and related chemistry, which responds and in turn signals danger back to the brain: this is a loop that’s really hard to break. We can interrupt this cycle by learning to work directly with the organs involved with stress chemistry and interrupt their frantic signalling. When helping clients harness their life energy in an authentic and powerful way that will last –you too must do the work for yourself, first. If you don’t, you won’t be able to match their energy, be comfortable with the big emotions that are often part of it, and they won’t feel supported and safe in the process (the unconscious spidey – nervous system – senses will feel it!). To take our clients to their highest levels it’s critical to consistently aim for our next level of evolution, education, and yes healing our own trauma. It’s important to remember that we are role models for our clients and students. This isn’t about being perfect and enlightened. Far from it. But it’s about doing the deeper, sludgier work that many shy away from. It’s about baring your teeth and digging your fingernails into the dirt of your past and clearing away the toxicity from your cells. Clearing your own toxicities will help other clear theirs too! 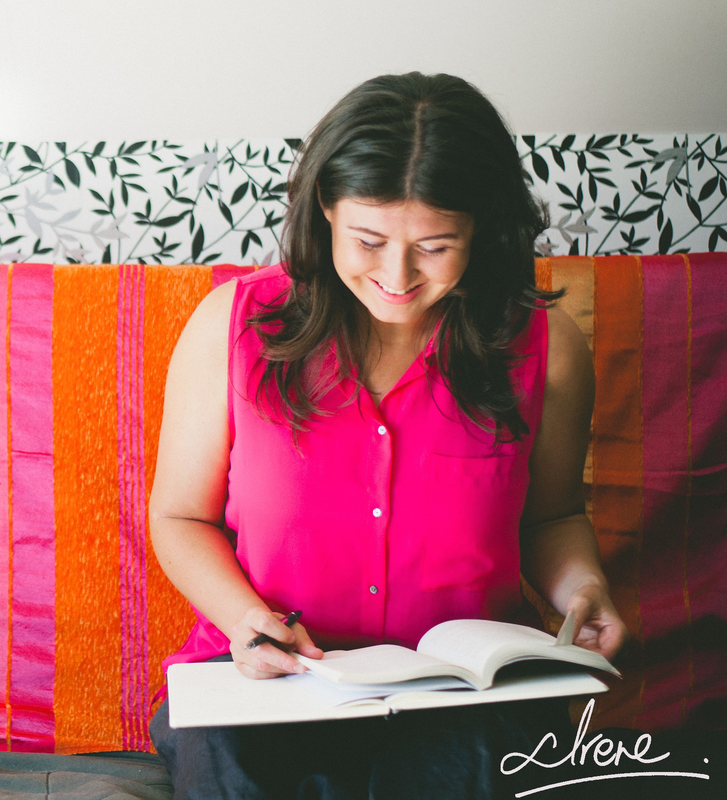 This work takes bravery and by doing it you’ll be a mentor for others to do the same. Trust me on this one!